Located at the corner of 2nd Ave and 50th St, Extra Space Storage serves Brooklyn residents near Sunset Park, Greenwood Heights, Bay Ridge, South Slope, Park Slope, and more. Locals will recognize our facility a few minutes northeast of Calvary Hospital. With a variety of storage units, climate-controlled storage, and exceptional security, Extra Space Storage on 2nd Ave has the Brooklyn self storage options you need near Sunset Park! Our Brooklyn storage facility has units from 5x5 to 10x25, making it easy to store items of all sizes. Units also come with convenient features like indoor access, first-floor access, and elevator access. With electronic gate access, 24-hour video surveillance, and security access to your floor only, you can rest assured that your valuable belongings are well-protected at Extra Space Storage. If you plan to store temperature-sensitive items in Brooklyn, we highly recommend renting a climate-controlled unit. Storage units with climate control stay between 55 and 80 degrees no matter the season. Extra Space Storage truly cares about your satisfaction. From our clean, secure, well-maintained facility to our friendly, professional staff, we strive to deliver an excellent self storage experience for each and every customer. If you have any questions or need help, we're here for you. 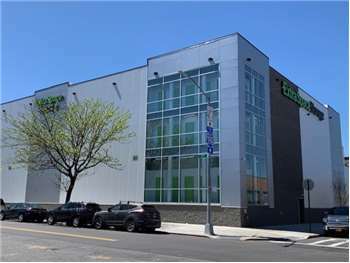 Contact us today to reserve a storage unit in Brooklyn! Drive southwest on I-278 W. Take Exit 23. Turn left onto 2nd Ave. Our facility will be on your right at 50th St.
Drive northeast on I-278 E. Take Exit 23. Turn right onto 4th Ave. Turn right onto 45th St. Turn left onto 2nd Ave. Our facility will be on your right at 50th St.
Drive west on 49th St. Pass I-278 and continue west. Turn left onto 2nd Ave. Our facility will be on your right at 50th St.
Drive east on 50th St. Our facility will be on your right at the corner of 2nd Ave.